I wrote the original version of this on December 22, 2007. I intended it to be a fun treat for the holidays. 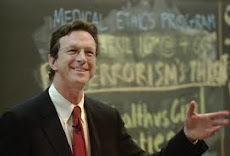 With Michael Crichton's untimely death, it's poignant to think about what he gave us. In 2009 I revised “A Michael Crichton Christmas” to include Pirate Latitudes. My good friend Erik and his friend Angel, with some help from their families, created a video based on it.It’s amazing and I can’t believe they put all that work into it! Even though nothing new by Michael Crichton was published this year, I keep finding interviews and essays that he did. So it’s like hearing his voice anew. I've been trying to track down every word Crichton ever wrote or uttered in an interview or speech. Even though I've spent years at this, I’m still discovering things. Sometime next year I’ll post a list of all I've found. Most are not online but can be found through university libraries. If I can obtain permission to post any on this blog, I will do so.